“And Jesus found a young donkey and sat upon it; as it is written, ‘Fear not, daughter of Zion; behold your kind is coming, sitting on a donkey’s colt!’ His disciples did not understand this at first; but when Jesus was glorified, then they remembered that this had been written of Him and had been done to Him” (John 12:9-19). If you didn’t hear, or read the Palm Sunday processional gospel, it is today’s reading. 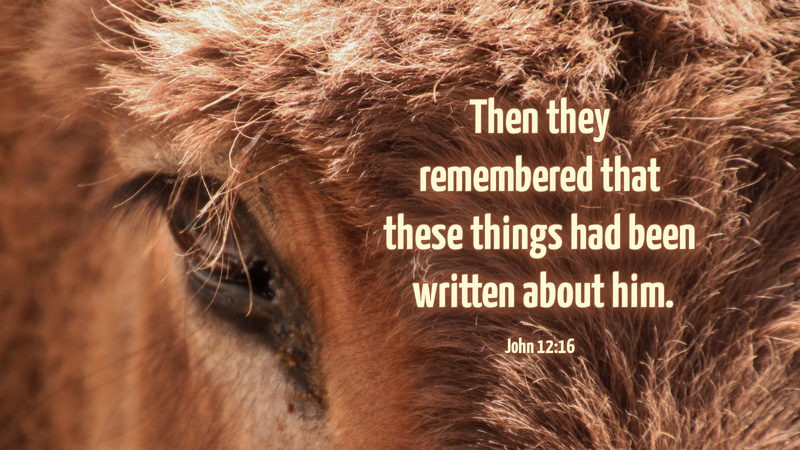 John, one of the disciples of Jesus, tells us they didn’t understand, at first, what happened and why. It was after Jesus was risen that they remembered the prophecy—and that it was fulfilled by Jesus’ entry into Jerusalem on a colt. The truth is, most of the events of that first “Holy Week” were not understood by those first disciples. They were surely confused, frightened, lost, troubled by all that happened to Jesus. His Palm Sunday entry, his Last Supper, the command to “do this for the remembrance of me”, His praying in the Garden, His arrest, torture, crucifixion. All of this threw the disciples into a state of shock, leaving them, finally, huddling behind closed, locked doors for fear that the same thing that happened to Jesus would happen to them! This is how it is for us, as well. We may not know or understand God’s great plan for the salvation of the world. We may not be able to explain how and why it happened as it did. But our Lord opens our minds to understand how the Scriptures bear witness to Him, and we know Him with us in “the breaking of the bread”—in our weekly celebration of our Lord’s Supper! Prayer: Lord Jesus, as we walk with you through Holy Week, open our minds to understand the Scriptures, and reveal yourself to us in the “breaking of the bread.” Amen.